Temaril-P is used to treat itching and coughing (including kennel cough) in dogs. How it works: Temaril-P contains trimeprazine and prednisolone. Trimeprazine is an antihistamine, which helps relieve itching and coughing. Prednisolone is a corticosteroid that reduces inflammation. Cautions: Temaril-P should be given with food to prevent stomach upset. May cause drowsiness. Do not give to pregnant dogs. Dosage & Administration: Give this medication exactly as directed by your veterinarian. Do not give more or less than is prescribed by the veterinarian. If you do not understand the directions ask the pharmacist or veterinarian to explain them to you. The usual dose of Temaril-P is based on weight. For dogs up to 10 lbs gibe 1/2 tablet, for 11-20 lbs give 1 tablet, 21-40 lbs give 2 tablets and 41 lbs and up give 3 tablets. These tablets are given twice a day. After 4 days, the dose is typically reduced to 1/2 the initial dose. Keep plenty of water available for the pet. Temaril-P should be given with food. Store Temaril-P at room temperature away from moisture and heat. Keep this medication away from children and pets. 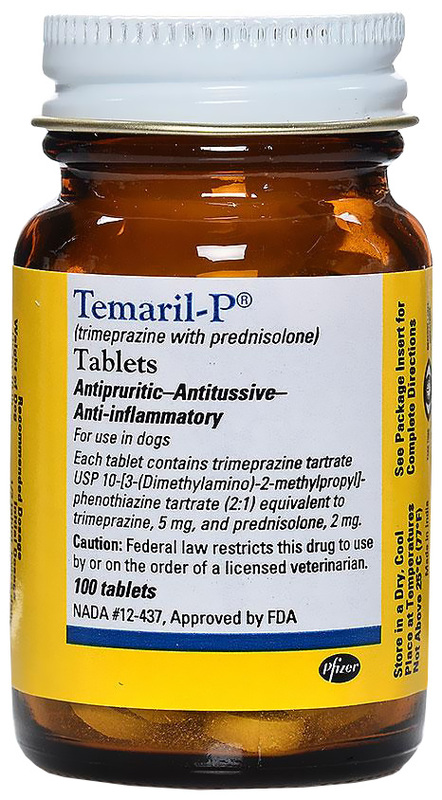 Temaril-P is a combination of an antihistamine (trimeprazine) and a corticosteroid (prednisolone) available by prescription for use in dogs. Temaril-P is used for the relief of itching regardless of cause. It is also used in the treatment of various cough conditions such as kennel cough, bronchitis, and coughs of nonspecific origin. Allow plenty of water for the pet to drink. Tip: Do not use in pregnant or nursing animals. Tapazole can be given with or without food. Storage: Store Temaril-P at room temperature away from moisture and heat. Possible side effects of Temaril-P: If any of the following serious side effects occur, stop giving Temaril-P and seek emergency veterinary medical attention; an allergic reaction (difficulty breathing; swelling of the lips, tongue or face; hives). Trimeprazine can cause drowsiness, tremors and muscle weakness. Prednisolone may cause symptoms of Cushing¿s disease which include increased thirst, urination and hunger as well as vomiting and diarrhea. Other side effects may also occur. Talk to your veterinarian about any side effect that seems unusual or bothersome to the animal. If you miss giving a dose: Give the missed dose as soon as you remember. However, if is almost time for the next regularly scheduled dose, skip the missed dose and take the next one as directed. Do not give a double dose of the medication. If you overdose the pet: Seek emergency veterinary medical treatment. Symptoms of overdose may include excess drowsiness, low blood pressure, and seizures. What should I avoid while giving Temaril-P: Do not give Temaril-P to dogs allergic to it or to either of its ingredients. Temaril-P should not be given to dogs that are pregnant or that are diabetic. Temaril-P may cause drowsiness. Do not use any vaccines without checking with the veterinarian. What other drugs will affect Temaril-P: Do not give any other over the counter or prescription medications, including herbal products, during treatment with Temaril-P without first talking to the veterinarian. Many other medications can interact with Temaril-P resulting in side effects or altered effectiveness. These include sedatives, anesthetics, pain medications, epinephrine and procaine.